Two-time alumna Valarie McCall, BA ’95/MPA ’97, chief of government/international affairs for the city of Cleveland. She was a Host Committee member and the city’s point person for the RNC. Prepping for the big event and the convention itself was a “24/7, whatever is needed, get it done whatever it takes” effort, she says. 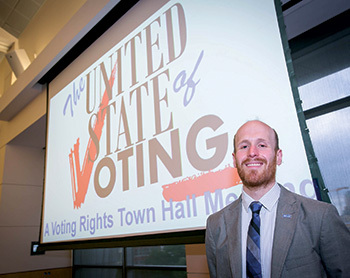 Mike Brickner, MA ’09, is the Ohio senior policy director for the American Civil Liberties Union (ACLU). He had a lead role in overseeing the ACLU’s efforts during the RNC to protect free speech and the rights of protesters. This included helping to staff the organization’s “war room,” where he and colleagues monitored protests as they developed, and the police response, to ensure that speech was not being repressed. He also spoke at a town hall meeting on voting rights held at CSU and hosted by alumna/Congresswoman Marcia Fudge, JD ’83. • Rock Box public art, which featured giant, bright loudspeakers playing music from Rock and Roll Hall of Fame inductees. • Sirius XM interviewed President Ronald M. Berkman about the RNC’s impact on Cleveland. Dr. Berkman also talked to the Hechinger Report about Donald Trump’s plan to base student loans on employability. And he did an interview with a TV crew from CP24 in Toronto. • At the TEDxSalon, Interim Dean Lee Fisher did an interview with NET TV from New York City. • Associate Professor Ed Horowitz spoke to television crews from Tunisia and Brazil. • A crew from Attessia TV in Tunisia interviewed assistant professor Sarah Rutherford about the Get Out the Vote exhibit in the Galleries at CSU. • Richey Piiparinen of CSU’s Center for Population Dynamics talked with the BBC about Cleveland’s strengths and weaknesses. Also tapping his expertise were USA Today, BillMoyers.com, Agence France-Presse and the U.K.’s Daily Mail. • Associate Professor Debbie Jackson took part in a PBS NewsHour panel on Rethinking High School. • CBS News interviewed Ohio City restaurateur and CSU alumnus Sam McNulty, BA ’97, for a segment on Cleveland’s comeback. • CNET plugged the Cleveland Historical app developed by CSU’s Center for Public History + Digital Humanities.